For the cyclist who cannot take 23 days off, but still wants to join us on Ride the West, try Ride the West - South. The third and final section of Ride the West travels 590 miles in 9 cycling days. Pedal along the coast in Monterey, up through Carmel Valley, and along the beaches of southern California as you ride from San Francisco to Costa Mesa CA..
Ride the West - South begins riding towards the Golden Gate Bridge and its many photo opportunities. After leaving San Francisco, the ride skirts the scenic California coastline to Santa Cruz. It heads inland but not until after a ramble through Fisherman’s Wharf and Cannery Row, Monterey Peninsula’s 17 Mile Drive with it’s multi-million dollar homesites, Spy Glass Hill, and Pebble Beach Golf Course. You will experience more variety on the last leg as it turns inland to Carmel Valley through the famous golden hills of California and through some of the richest agricultural areas in America. 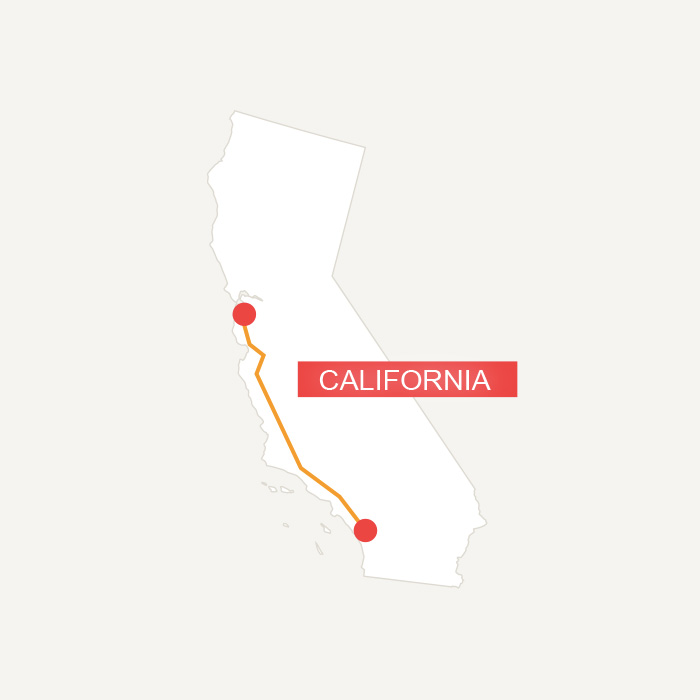 After a stop in the Scandinavian town of Solvang, the ride follows an old stagecoach route through the mountains before descending back to the coastal town of Santa Barbara. The final days pass through Malibu and Santa Monica and conclude with scenic miles on local bike paths to Newport Beach and our final destination of Costa Mesa. Register online for the ride of a lifetime. Make your commitment today. Then start your training and get ready for a bicycle ride you will never forget. Remember once you arrive at the ride start city, let America by Bicycle take care of all the details. You just ride your bike everyday and explore America. Get ready for real cycling adventure. Plan your cycling calendar now and don't miss the training window. Be sure to sign up in time for 2019 or you’ll have to wait until 2021!